SCARY #2 - Another Scary Summer Out-of-this-World Special SORRY SOLD OUT! 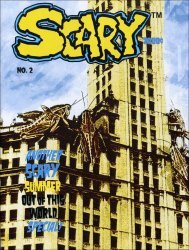 MyMovieMonsters.com > SCARY Magazine > SCARY #2 - Another Scary Summer Out-of-this-World Special SORRY SOLD OUT! This is SCARY #2, another Scary Summer Out-of-this-World Special published in 2014. The Thing from Another World and much more!